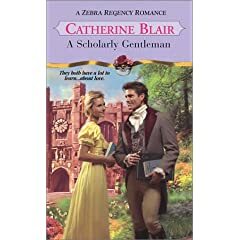 I don't usually read category romances, but D. got this one for me for a larf a couple of years ago and as I am still fighting an ear infection and have no energy to read anything heavy, I thought I'd give it a whirl. And I have to say, for a category romance, it wasn't bad. After the truly painful Madrigals and Mistletoe, I was wary of categories in general and Zebra Regencies in particular. This one proved that shorter romances can be good (somewhere in the B range) and needn't necessarily be formulaic. The story is about Jordan DeVaux, an astronomy professor at Cambridge. Jordan's cousin has just died, leaving him a lordship and a mountain of debt to deal with, not to mention a strong-willed widow. She also happens to be the same woman who Jordan was once engaged to until she called the wedding off and ran off with his cousin. Will they possibly ever get back together? The agony is unbearable! -he's a "rocket ship entering her heavenly body"
-anything about her "celestial orbs"
*Although as an aside I hate it when they get details wrong: they kissed in the observatory, not the library, ppl! Sorry Kathryn - I'm tapped out. You got all the best ones!